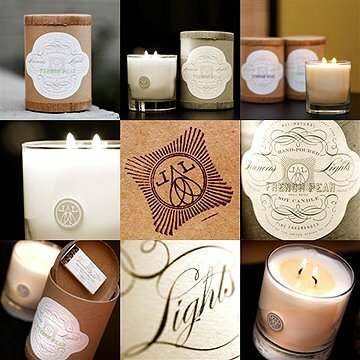 A few days ago I mentioned Velvet & Linen's giveaway for some wonderful candles that the author, Brooke, recently started to carry in her shop. I was lucky enough to have received one of these candles today in the mail and I wanted to let you know that they are spun from heaven. I went with Sweetgrass and it just makes me smile to smell the understated sweet and fresh scent filling my home. I was very excited to get this candle because earlier this month I discovered one of my most favorite designers (Eric Kass of F U N N E L) did the design work for Linnea's Lights and I feel in love. Take a peek here and/or here... and if you cannot resist - contact Brooke's shop to order one for yourself. I'm thrilled that you love these candles as much as I do! are such a dream to work with! Thank you for doing this post and introducing me to Eric Kass. I am off to check out his website.